College Football has a major problem–check that. The NCAA has a major problem. In the wake of several big investigations, including Oregon, North Carolina, Auburn, Ohio State and USC, Yahoo! Sports’ release of their story of the Miami Hurricanes and the cash, jewelry and other debauchery funded by convicted Ponzi Scheme artist Nevin Shapiro is the most recent problem the NCAA will have to review, and ultimately, impose sanctions. Unfortunately, it is the college programs facing the heat, when the NCAA continues to make extremely questionable decisions. Case in point, the NCAA’s handling of Auburn and Ohio State’s programs last season, and their ultimate decision to let Heisman quarterback Cam Newton play in the final games of the 2010 season, which included the lucrative BCS title game against Oregon. What was even more disturbing was their decision to not impose the five-game suspensions on Ohio State’s athletes until this fall, allowing the suspended OSU players to play in last year’s Sugar Bowl. A Sugar Bowl without Ohio State stars Terrelle Pryor, Dan Herron and DeVier Posey, among others would have resulted in a minimally hyped bowl game with less cash to collect. The NCAA wanted to make sure that they and the game’s sponsors got to cash their checks before they hammered OSU and their program. Make no mistake about it. It all has to do with money, and the NCAA hauls in more than its share–they reported budgeted revenues of $757,000,000 in 2010, the majority of that revenue coming from college football. The BCS games and fees the NCAA collects for using their logos on many items and games, including the ever-popular NCAA Football games produced by EA Sports have generated the machine that operates the NCAA. The NCAA allows EA Sports to use their logo and players who have the same size, skill sets and jersey numbers as the actual football players from each school that is represented in the game. Essentially, the NCAA’s message is loud and clear: It is against the rules and there will stiff consequences for exploiting college athletes….unless the we ( the NCAA)are the ones making the money off playing the role of pimp for the student-athletes. The real question we should be asking is where are the checks and balances here? Who does the NCAA have to answer to? If it is okay for the NCAA to push nearly $1 billion for exploiting these kids, then how are they any different from the boosters, agents and runners that have created so much damage to schools like USC? College Football is in a different place, economically and culturally, than it was when many of the NCAA rules were written and instituted, and until there is a committee or governing body reviewing what the NCAA is doing, the playing field will not be balanced, and they will continue to be judge and jury. If the NCAA is going to deposit the checks from the juggernaut that is college football, then they should have to answer some of the questions and more importantly, they should have to recognize that they must adapt with the changes and nuances that come with a billion-dollar-plus machine. And if the last 18 months have shown anything, it is that the current system is not working. Unless something changes, 18-22 year old athletes will continue to drive millions and millions of dollars to their respected schools and the NCAA, but the kids will be punished for reaping a fraction of the monetary benefits they generate. Why College SuperStars Are Bad for Their Teams and the NCAA–by Christian Hon/Contributor. Interestingly, they all have several things in common – they were all prized recruits – all, except Mayo, touched or have been within a win of the national championship trophy and all have or will leave their team in worse shape than when they arrived. I’m sure you expect this diatribe to steer towards the familiar road of “The Case For Paying College Players” but it won’t. In fact, you can’t. The nuances of college sports and what make them great is exactly what prevents you from doing so. The fact remains however, a super star athlete, especially a superstar football player, at the college level is more often the fuse that ignites a negative PR bomb more than a “get over the hump to greatness” one. I recently finished reading Tarnished Heisman – How Reggie Bush Turned His Last Year At USC to a Six Figure Job and got to thinking, do I really want my favorite team to get a player like that? The quick answers is yes. All college football fans are glued to their TV and computer for national signing day. Short of our bowl game, it’s the biggest day of the year. What ranking we achieve by the recruitment review services is as much of a bragging point with our rivals as our record and/or bowl game finish. With each star that our recruits receive, more hope springs for the following 4 years. A thought out answer tells us a different story however. 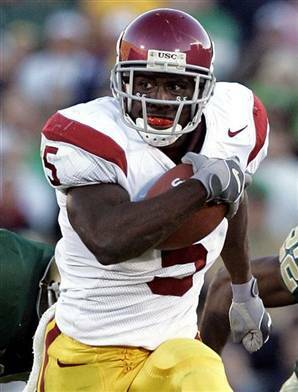 Are USC fans glad that Reggie Bush is considered a Trojan? Will his number be retired? When you thought of Auburn a year ago, what came to mind versus what you think of now? ( Crimson Tide fans please refrain from answering this one – you skew my point ) Is it coincidence that post Bush, USC have lost their dominance? If so, what about Phillips at Nebraska? 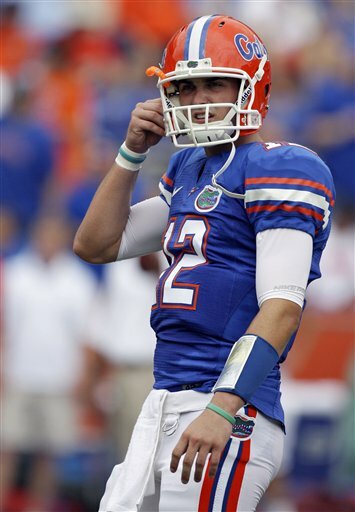 What about Pouncey at Florida? Clarett at OSU? What about the glaring post Warrick years at FSU? Don’t get me wrong, there are several superstars that are never caught up in these media storms – Sam Bradford, Tim Tebow, etc. But if you look at the averages, you can’t deny that the greatest teams are typified by a crescendo of winning years leading to utter dominance, then severe drop off. Adding to the headaches of departed stars are the pitfalls they often fall in to while at their university. All the aforementioned players had significant stories of misconduct to explain away, some of which added to the challenge of replacing them because of the imposed NCAA sanctions. The NCAA is this strict because anything less than severe punishment of any impropriety is a swing in the direction of college football being a business ( which it is) and they can’t have that. By trumpeting the “passion of the game” and purity of college athletics” their coffers stay full while they 18-22 year olds kill each other in the weight room and on the field for the glorious payment of free tuition, room and board and food. And for the really good teams, there are goodie bags of portable DVD players and sweatshirts at the bowl game but you better not sell them or you’ll be expelled! I root for my favorite college team with true passion and live and die with the scoreboard on Saturdays in the fall. I, as much as any fan, have my favorite players on the team and they are often the players scoring the most points, making the most tackles and featured in an expose by Erin Andrews. With that said, I fear the day that my team gets a true top-level player that can change the outcome of a game by himself. The more media attention we receive, first place recruiting votes we garner and appearances at the Heisman ceremony we have, the closer we are to the dark days of “rebuilding.” Can you hear me post Gino Toretta Miami fans? Ok, ok…post Charles Woodson Michigan fans…no? Post Peyton Manning Tennessee fans? Just months after hammering USC for violations, the NCAA didn’t even seem to slap Ohio State on the wrist for its players’ involvement in the selling/bartering of sports memorabilia to the owner of a Columbus tattoo parlor. Instead of suspending the players right away, the NCAA erred on the side of caution–and TV ratings for the Sugar Bowl–and let the violations slide until the beginning of the 2011 season. Otherwise, the 31-26 Ohio State victory over Arkansas would have likely been a much different outcome, considering quarterback Terrelle Pryor (one of the players who will miss the first five games next season) took home Sugar Bowl MVP honors after compiling 336 total yards in the game. 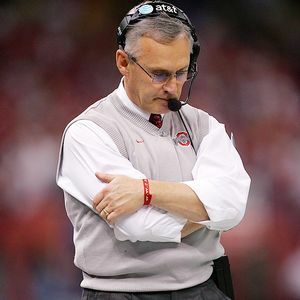 Today, a new development was uncovered that head coach Jim Tressel was made aware of the violations in an email last April that several of his players were selling signed memorabilia for money and free tattoos. Upon hearing the news, Tressel did nothing, and admitted as much in a press conference where it was announced that he will be suspended for the first two games of this season for not coming forward with this information to the administration, and more importantly, to the NCAA. Things could quickly go from bad to worse for Tressel and Ohio State for two reasons. 1) The NCAA has already taken plenty of heat for the sanctions (or lack thereof) they issued to Ohio State during the Sugar Bowl and 2) It turns out that the owner of the tatoo parlor, Eddie Rife, is under federal investigation for drug trafficking, which could easily open Pandora’s box on the program. Tressel is known for his clean-cut, tie and sweater vest image, but this isn’t his program’s first clash with NCAA violations. In his 10-year stint at Ohio State, his program produced multiple issues and violations with troubled running back Maurice Clarrett after the Buckeyes won the 2002 National Championship. As the NCAA is forced to peel back more and more layers to what they don’t know and what they weren’t told, you can bet that college football fans (especially at USC) will be paying close attention to any further punishment that is handed down. Well, I was all set to provide my first game day breakdown, and the game I had selected for week one was LSU vs North Carolina. On paper, it looked like a great match up–the preseason AP ranks UNC #18 and LSU at #21, and our College FootBlog Preseason rankings had LSU ranked #18 with UNC slightly behind at #23. On paper, this match up looked like a great opener for the 2010 college football season–at least it did a week ago. That was before it was announced a couple of days ago that the NCAA has expanded its investigation into North Carolina’s program. What started as an investigation into a couple of UNC players for attending a party in Miami that was allegedly funded by a sports agent has now expanded to a full-blown academic fraud investigation. No one knows how long the investigation will last, but we will find out next weekend which players are involved. That’s because all of those players will be noticeably absent from the playing field. And the impact is massive. Without what is basically North Carolina’s defense, which ranked sixth in total defense last season, the game on paper has gone from being a great opening day match up to a preseason scrimmage for LSU, so much so that Vegas pulled the game completely from the lines yesterday. 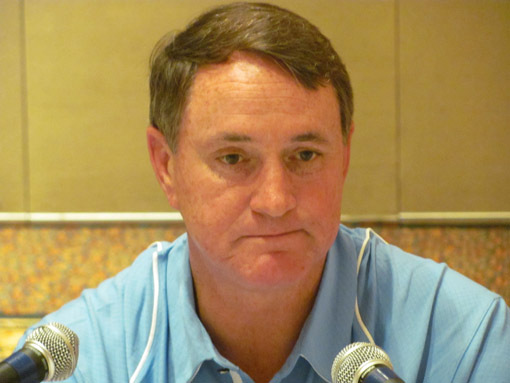 Even with what seems to be an imminent beat-down for the Tar Heels on Saturday, a week one loss only scratches the surface of what Coach Davis and UNC fans should be worried about. If this scandal reaches as far as it appears and affects as many players as it is being reported, this scandal could set the North Carolina program back 3-4 years. When the NCAA dropped the hammer on USC a few months ago, cutting several scholarships and banning the Trojans from post season play for two years, they established a much more stringent and unforgiving stance on major violations. Because the NCAA unleashed these heavy sanctions on Southern Cal just months ago, they will have to be just as stern going forward, and they will have to be even more so, given the short time since the USC sanctions were announced. In three short years, Coach Davis has taken his team from a middle of the pack ACC team to a preseason top 25 team. Unfortunately for him and UNC, his program could easily drop back to (or beyond) obscurity in less time that it took him to build. Only time will tell, but we know this much–this Saturday could mark the last time North Carolina will be ranking in the Top 25 in college football for a long, long time. For the elite high school quarterbacks in the country, the opportunity to play quarterback at one of the bigtime college football programs is a dream come true. One major factor in making the final decision on which program gets the signature on the letter of intent is the degree to which that individual player will be prepared for the next level (the NFL). The high-powered programs like Florida, Oklahoma, Miami and USC are just a few of the major BSC schools that elite high school quarterbacks consider, and why not? These teams are known for their juggernaut offenses, and they are consistently in the hunt for a national championship. College FootBlog takes a deeper look into the progress of the top performing quarterbacks from the NFL and where those QBs played their college ball. If you are a coach or a parent of an elite QB, the you may want to take a hard look at the numbers because you’ll probably be very surprised. For a number of reasons, which we will cover later, the major programs typically do not groom their top-tier signal callers for the NFL. Let’s take a look at the passer ratings from the last season. Of the top ten quarterback ratings, only two, Peyton Manning (Tennessee) and Tom Brady (Michigan) went to perineal BCS power houses, and Manning was ranked sixth, with Brady at #9. 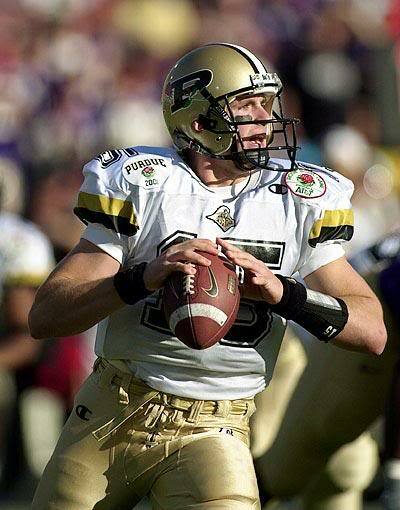 Purdue’s Drew Brees was the Superbowl MVP and the top-rated QB in the NFL last year, with a QB Rating of 109.6. Brett Favre was a close second and is a sure-fire, first ballot Hall of Famer, and he played at Southern Miss. Phillip Rivers was the 3rd-ranked QB last year and has been a dominant player since his arrival in 2004, but NC State is not exactly known as Quarterback-U. Aaron Rodgers was #4 and played at Cal, which doesn’t have the glamor of USC, but he outperformed his former rivals from LA last season. Matt Schaub was ranked seventh and hails from the University of Virginia. The other three QBs in the top ten really dispel the idea that you have to go to a bigtime program to prepare for the NFL. Fifth-ranked Ben Roethlisberger went to Miami–no, not that ‘Miami’…Miami of Ohio. Eighth-ranked Tony Romo and 10th-ranked Kurt Warner played Division IAA (or FCS for those who are up on the new abbreviations) at Eastern Illinois and Northern Iowa, respectively. Now, let’s take a look at the lowest ranked QBs from last year’s NFL season. Five of the worst eight QBs in the NFL last season were from major programs, including #32 (the worst) first-round bust JaMarcus Russell from LSU. Former USC quarterbacks Matt Cassel and Mark Sanchez were numbers 25 and 28. Former Notre Dame star Brady Quinn came in at #27 and rookie quarterback Matthew Stafford struggled in his first season out of the University of Georgia, ranking 29th. When digging into the numbers it really should not come as a huge surprise. Afterall, the quarterbacks at the major programs typically have a bigtime advantage with their receiving corps versus the opposing secondaries. For example, in Stafford’s last season at Georgia, he had 6’2″ and 2nd round pick Mohamed Massaquoi and soon to be first rounder AJ Green, who is 6’4″ and could be the best wideout in the country this year. Even in the SEC, which is widely known for being the best conference in college football, the dominant programs have bigger, faster and stronger WRs, creating bigger windows to throw into and much more room for error. In the NFL, it is typically the cornerbacks that are the fastest players on the field, and while they may be at a disadvantage in size, the talent pool is much smaller, and those large windows to complete passes are not only smaller, but they also close very quickly. In the NFL, a ball delivered a split-second too early or too late is the difference between a completion and a pick-six for the defense. The QBs at the lesser-known programs have to deal with a more balanced and level playing field and often do not have this colossal advantage with their receivers, forcing them to make better reads and to thread the needle, instead of throwing to an area. In the end, there are a few low-ranked QBs that could easily turn things around. After all, Mark Sanchez and Matthew Stafford were only rookies last season, but the trend is quite staggering when you take away all the glamor and simply look at production on the field. For the time being (and seemingly for the immediate future), it is the underdogs that continue to lead the way. Are the USC Santions Punishing the Real Offenders? This morning, multiple media outlets are reporting that the NCAA will be cracking down hard on USC for rules violations over the past several years. The major allegations involve Reggie Bush in the football program, and OJ Mayo from his years on the Trojan basketball team. The sanctions that are reportedly being imposed will include the football program missing the post-season for the next two seasons and losing up to 20 scholarships. In anticipation of the NCAA crackdown, the USC basketball program has already begun imposing their own sanctions, which has included reduction in scholarships and barring themselves from the NCAA and NIT post-season tournaments. The big problem of these sanctions that the individuals involved in the violations are gone. 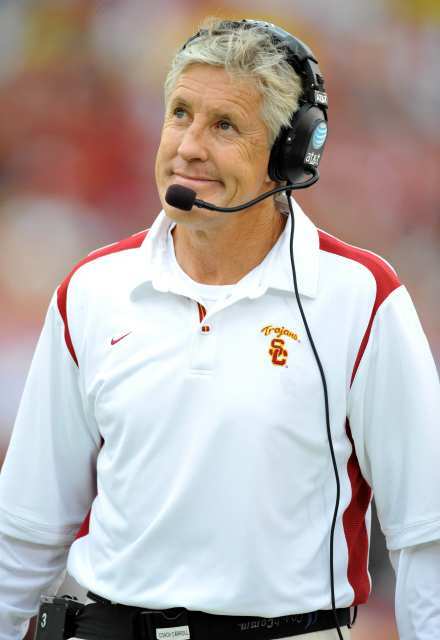 At the conclusion of last year’s college football season and it was apparent that the program would be disciplined in some capacity, former head coach Pete Carroll caught a flight to Seattle and promptly accepted a new gig with the NFL’s Seattle Seahawks. Last summer, amid countless allegations of recruiting violations, former head basketball coach Tim Floyd resigned, claiming he had just “lot enthusiasm for his job.” The two athletes who have been the center of the violations, Reggie Bush and OJ Mayo are long gone as well, making their money in the NFL and NBA. As the NCAA makes an example of USC, there is one problem with the sanctions–the guilty or corrupt individuals who caused this mess are suffering zero consequences. The ones who are being punished are the current athletes, who came to USC with the hopes and dreams of winning on the largest of stages. And those dreams will be stolen because of mistakes that other people (people who are long-gone now) made. At least new recruits will get the opportunity to weigh whether or not they want to go to a program that will not have an opportunity to generate a full recruiting class and compete for a national championship. The others who are already enrolled do not have that luxury. They will instead be held hostage for the next two years because of lack of ethics from four individuals who managed to pack up and leave before the storm hit. In this case, the NCAA had to react and show that these violations will not be tolerated, but it is a shame that we are in a society that passes the buck so easily and so quickly. It would be refreshing to see someone other than a bunch of 18-22 year olds who were not involved in the actions from the last decade step up and accept the consequences for what they have done. College FootBlog would like your feedback. Is the NCAA right? What other alternative sanctions could there be?